My MIL's birthday is tomorrow and every year it is a challenge to figure out what to give to her. As she has some lower back issues I thought about making her a heating pad that she can heat up in the microwave. 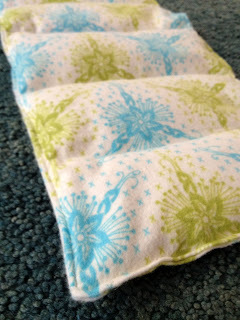 I found an excellent tutorial from Abbie of The Green Wife for a Heating Pad Tutorial. It finishes up at 18" x 7" and took me just about an hour to make. Sure hope she likes it. Oh well, I'm making her a cake too so my chances are good that she'll be happy. Oh, I like that one. She also will. 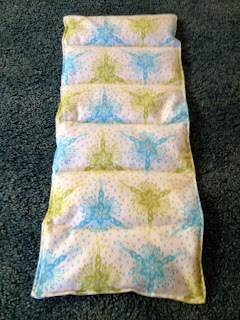 The tutorial uses serging. Did you serge yours or skip that step? 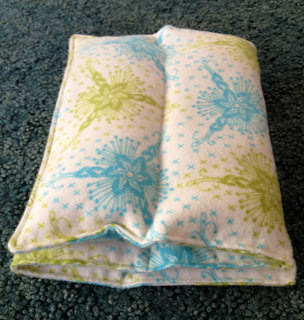 I'm doing spa-themed items for a silent auction basket and this would fit the bill, but I don't have a serger. Yours turned out great! Something else to think about, that if these get used a lot they can get a little grungy, and they don't really wash, so a little custom pillow case or two might be a good addition. Love this idea! Velcro would work very well as a closure. Sandy H: I have a Janome and have a foot that does a fake serging stitch (doesn't cut the fabric). It is the 'C' foot. So pretty, and I'm sure she will love it! What did you fill it with?